Learn to cast the fun way. THE British Fly Casting Club (BFCC) puts on a series of annual meetings around the UK – see: www.thebfcc.co.uk under Calendar, where any casters can expect a friendly welcome and to improve their casting. 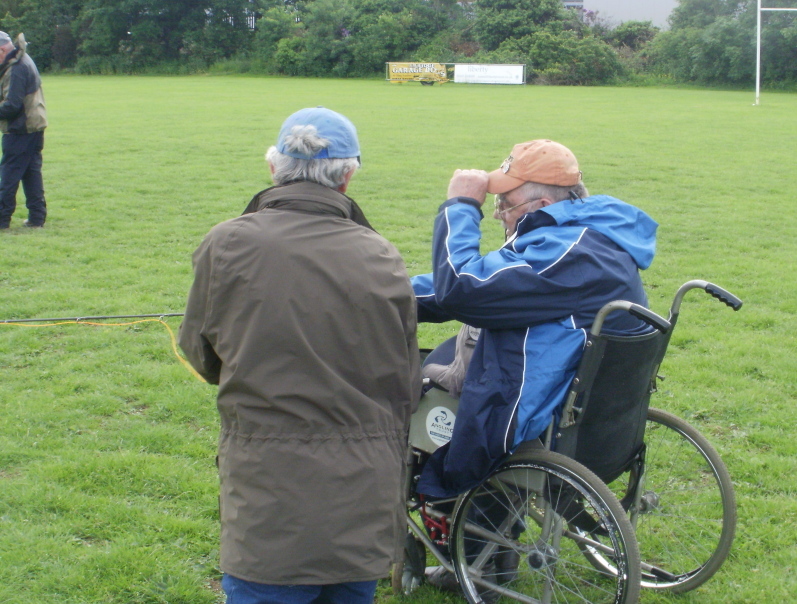 At the meeting at Oswestry on June 15, member Nigel Rogers achieved a superb result by casting his 7wt outfit 87ft 8in from his wheelchair and won himself a 25-yard badge. But perhaps, more importantly, he vowed to return again to achieve the 30-yard badge he so nearly won. A situation has arisen where Mike Marshall will not be able to attend the Glasgow meeting on the 8th of September. As you all know Mike usually drives to each event bringing all the rods, reels and other equipment necessary. On this occasion it is proving difficult to make alternative arrangements, especially for the heavier tournament rods. If any of you can offer either help or a useful suggestion could you please email or phone Mike and let him know. I have heard it’s quite grim up north but from what I saw as I drove up the A1 wasn’t grim at all, quite lovely in fact, and Alnwick is quite a picturesque little town. I normally turn left at Scotch Corner so when I didn’t I was in entirely new territory. This was the first BFCC event in the North East so it was a bit of a shame that all Peter Thains efforts to get a good turnout didn’t quite materialise but we had the benefit that because we were so far north we had the pleasure of a few of our Scots friends making a trip south so all in all we had quite a good event. The wind might have been a bit kinder. The direction was steady but varied from zero to gusty in the space of one false cast to another but generally blew quite strongly all day, it was a real rhythm breaker, you thought you had set yourself up for a decent cast and then a gust would blow your back cast out or it dropped away just as you hit the delivery. Despite this there were still some creditable casts and Peter did increase the ST 27 record to a more respectable 161+ft. Not out of sight so still all to play for. In fact the only events Peter didn’t win was the #7 (me) and the B100 which was won by Mike Barrio, who seemed slightly disappointed he hadn’t come last. Better luck in Glasgow Mike. That is the bare bones of the meeting but there is a slight sub text in that all the members who had driven up from down south were generally so busy that we didn’t have much of a chance to meet and socialise with the locals which is a great shame because we do pride ourselves on being a friendly club. Surprisingly one of the places we do get to know each other and can have a bit of banter is marking the lanes. The event can’t happen without markers and it’s a great place to look at how the different casters cope with the conditions, offer the odd word of encouragement or take the piss. At all our other events this isn’t normally an issue because everyone chips in but for some reason I can’t put my finger on it was an issue here. I appreciate this is a new area for us and this was the first event so no-one knew how we operated on the day. We do rely heavily on the people attending all mucking in and sharing the workload where they can. It makes the event come alive. Well done Tracy for taking the five and seven women’s records and to Wendy for extending her S50 women’s record. Really well done to Peter Thain for nearly getting a clean sweep and for getting us to Alnwick in the first place. Conditions were seemingly good for distance casting with a decent wind blowing for most of the day. Unfortunately there was also an unpredictable cross wind on the casting field which skewed some backcasts and dumped some good forward casts. Overall Position (points) – Peter Thain 7; James Evans 17, Ben Dixon 18, Kev Muir 23; Mike Heritage 24; Hugh Newton 35; Tracy Thomas 37; Mike Barrio 42; Wendy Bath 46; Dan Bruce 47; Alan Bath 48; Ian B 48.